Chinese and Chinese American history and culture are a long-standing and vibrant feature of Portland's landscape. Take a walking tour of Portland's Chinese district. Discover the tranquility and breathtaking artistry of the new Classical Chinese Garden. Savor a meal in one of Portland's diverse Chinese restaurants. Share in the beauty and festivity of the lion dance or the dragon boat races, as various Chinese events and celebrations enrich the city's calendar year. Contemplate Chinese artistic traditions at the Portland Art Museum. Portland offers visitors abundant opportunities for the enjoyment and discovery of Chinese and Chinese American culture throughout the city. “Four Seas, One Family” -- so reads the gateway to Portland’s Chinatown, commenting on diversity and unity in Portland’s Chinese community. Today, people with roots in Mainland China, Hong Kong, Taiwan and Vietnam, among other regions, live in and around the Portland area. Following World War II, as social and legislative discrimination diminished, the Chinese in Portland extended their homes, work and civic activities beyond Chinatown, and now live and work throughout the city. Celebrated with lion dances, the Lunar New Year (late January or early February) is the highlight of the Chinese calendar. 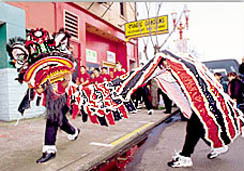 Portland’s lion dance teams practice martial arts throughout the year to perfect their technique. The Clear Brightness Festival in April honors deceased ancestors. Moon Festival in September takes place when the moon is closest to the earth and at its biggest and brightest. Dragon boat races are a feature of Portland’s Rose Festival in June. The rose, Portland's signature flower, was first cultivated in China 5,000 years ago. Chinese immigrants brought with them extensive knowledge of acupuncture, herbal remedies, vegetable seeds for their gardens, exquisite cuisine, sophisticated art forms, the practice of meditation, Taoist arts and Buddhism. From 1880 to 1910, Portland had the second largest Chinese community in the West. The Bing cherry was named after an Oregon farmer of Chinese descent. Portland is home to three tofu factories and two fortune cookie factories. Color is symbolic: red means good luck and happiness; gold, prosperity and money; white, mourning. Flower motifs represent the four seasons: plum, winter; peony, spring; lotus, summer; chrysanthemum, fall. Rice has six names in Mandarin. Fortune cookies are an American invention. Portland’s Yat Sing Music Club has performed classical Chinese music since 1941. Members of Portland’s Chinese community formed the American Chinese Brigade in 1898, serving this country during the Spanish-American War. Chinese roots run deep in Portland. Gold was discovered in southern Oregon and trade in furs, lumber, and agricultural products began between China and Portland. In 1851, the Tong Sung Restaurant and Boarding House opened its doors in Portland. Recruiters drew Chinese men, most from the Kwangtung Province of Canton in southern China, to work in the United States, where they endured backbreaking labor: building bridges, tunnels, railroad beds and as miners, and on into the 20th century in the salmon canneries, as well as in the iron, paper and textile industries. Even so, the Chinese community faced discrimination. In 1852 the Oregon constitution barred incoming Chinese from buying or owning property. The federal Chinese Exclusion Act of 1882 prevented further immigration to the United States from China. These laws were not repealed until 1943. From 1880 to 1910 Portland’s Chinatown was second only to San Francisco’s. Chinatown stretched from Taylor to Pine, and from Third Street to the west bank of the Willamette River. Chinese merchants catered to traditional tastes, offering housing, groceries, clothing, medicine, and a variety of services, restaurants and theaters. Vendors lined the streets. During Chinese New Year, Chinatown was aglow with paper lanterns and the staccato of firecrackers filled the air. Forced by a flood in 1894 and pressure from the city, Old Chinatown was vacated. New Chinatown developed in its current location. As for Old Chinatown, nothing remains today.